Part of winding down any calendar year includes preparing and filing your 2018 Business Taxes. Due to recent changes to the tax code, navigating tax filing as a small business owner can be confusing. How can you file to save the most money while staying compliant with IRS requirements? One of the most significant, and therefore eye-catching, changes incorporated in recent legislation is the reduction of the corporate tax rate from 35% to 21% for 2018. However, the bill also contains a substantial tax break for small business owners. Unlike larger corporations, which are taxed at a flat rate, most small businesses (there are a few exceptions) are regarded as “pass-through” entities, which means that profits from the business are taxed through ordinary income tax rates since they flow through the business owner’s personal income. This is because, no matter how much money these small businesses make, their profits are likely substantially less than those of a large, corporate entity. 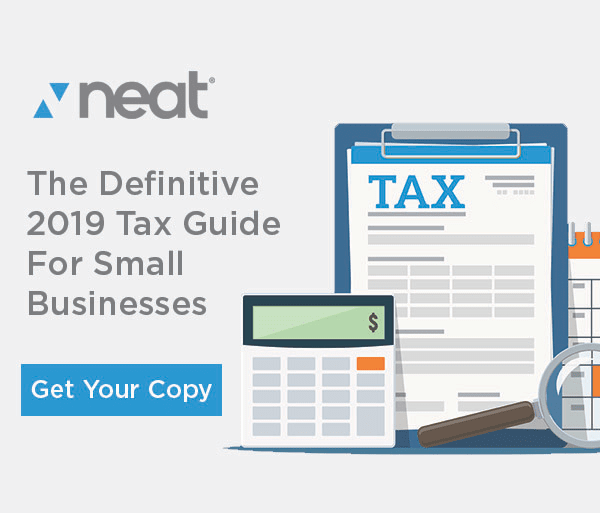 While pass-through entities will continue to be taxed at regular income tax rates, many small business owners will qualify to deduct 20% of their qualified business income, or QBI, effective 2018. This means that some pass-through entities will only be required to pay taxes on 80% of their pass-through income. This is excellent news for small businesses in general, but what does it mean for you? Here, we’ll discuss the particulars of how to navigate filing your 2018 small business tax return. Who Qualifies As a Pass-Through Entity? Generally, there are four types of business that qualify as pass-through entities: sole proprietorships, partnerships, LLCs, and S-Corps. Sounds fairly straightforward so far, but there’s a caveat: the IRS has some exceptions on who can be taxed as a pass-through entity. We’ll need to discuss some of those exceptions before we get started. We also need to note that this is not meant to be an exhaustive list. Even accountants still have questions about how the new tax law will be applied, so seek professional counsel if you need it. When it comes to the IRS, it’s better to be safe than sorry! These restrictions were implemented to prevent situations where business owners were reclassifying their W2 wages into pass-through income to take advantage of the 20% deduction, or where an employee left a company to start a sole proprietorship only to enter a sub-contractor relationship with the old employer and reclassify their W2 wages into 100% pass-through income. Any other trade or business where the principal asset of said business is the reputation or skill of one or more of its employees. In a fortunate last-minute change, engineers and architects were excluded from the definition of “service business.” While this list does explicitly name some fields, it still leaves many gray areas, leading many entrepreneurs to ask, “Am I considered a service business or not?” Unfortunately, we really need more guidance from the IRS to answer this question with certainty. If you are a service business, you may still be able to take the 20% deduction, as the final regulations implemented a phase-out of that deduction for owners of service businesses making more than a specific income threshold. This restriction only applies to your business if your taxable income exceeds the amount of $157,500 for individuals, or $315,000 for married couples. So, pending further clarification from the IRS, it would seem that owners of service businesses can still take the 20% deduction, provided their taxable income is below the applicable threshold. Businesses classified as S-Corps will be able to exclude “reasonable compensation” paid to the owner-employee from qualified business income, though they must strictly adhere to the existing reasonable compensation restriction. Sole proprietors, on the other hand, can count 100% of the income they generate as qualified business income, though they do not have the same liability barriers that other classifications do. QBI for partnerships and LLCs will exclude guaranteed payments associated with those companies. This creates a sort of vague area: while there is no “reasonable compensation” requirement for guaranteed payments to owners of a partnership, the IRS may implement one in the future, so consider your options carefully before switching your S-Corp to an LLC. The 20% deduction is a below-the-line deduction, which is important to know. The figurative line refers to the AGI line on your tax return (the bottom line on the first page of your Form 1040). While above-the-line and below-the-line deductions reduce your taxable income, you’ll need to know the difference between the two. Student loan interest, alimony payments, and a few other possibilities. Your AGI is important because it’s the number used to determine your eligibility for certain tax credits, as well as which below-the-line deductions you’re qualified to take. As a general rule, the lower your AGI, the more credits and deductions you qualify for. These deductions are the ones you report on the lines after the AGI calculation, and include many of your standard or itemized deductions and personal exemptions (there aren’t many in 2018). The 20% deduction for QBI will be taken here, and will lower the taxable income of small businesses (though not your AGI). We should note that the tax legislation states that the 20% QBI deduction will not be considered an itemized deduction, which is great news! This allows small business owners to claim both the standard deduction and the 20% QBI deduction simultaneously. This is important, because there are several major deductions being eliminated in 2018. It’s definitely safe to say that you may need to sit down with a tax professional to determine how best to file your 2018 taxes. Make sure you’re maximizing your deductions and taking the best course for your small business. Going into next year, make sure your business is prepared to kick-start 2019 the right way. Neat is cloud-based and mobile app software used by small business to capture track and manage expenses and organize them in a dynamic folder structure. In short, we’re like an automated bookkeeper you can take with you anywhere you go! Let’s say your a landscaper and are buying gas for the day’s work. You use the Neat mobile receipt capture app to snap a pic of your gas receipt at the station. Neat uses OCR (Optical Character Recognition) to pull the information off that will be needed for expense/spend reporting and tax prep. Then you’re done….toss the receipt because Neat stores an IRS-accepted image in our cloud database. There’s no limit on storage so you can keep years of info, safe and secure in the cloud. Then at key points during the year for business taxes, simply push a button and send the data into QuickBooks or to your accountant…or both. 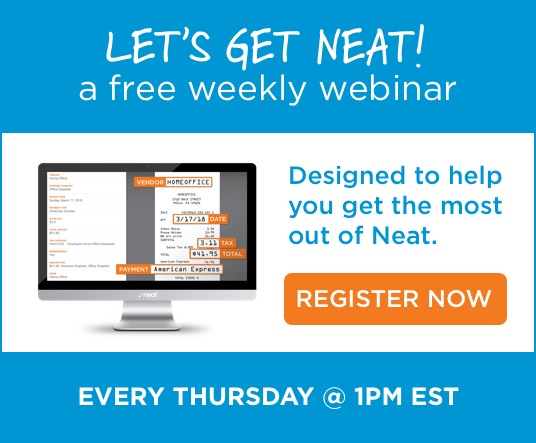 Today, Neat proudly serves over 100,o00 small business owners….let us help you. Try Neat free for 30 days!